Clemson Girl: Caroline's Tiger Pause - Clemson vs. UVA - Thank you seniors! Caroline's Tiger Pause - Clemson vs. UVA - Thank you seniors! I am so excited Clemson Girls for what has the makings of being an incredibly special, emotional, and memorable day in Death Valley. Clemson is finally on the cusp of winning the ACC Atlantic and going to the championship game in two weeks! If Boston College loses to North Carolina we are in no matter what, but we do not need any NC help because Clemson is taking care of business on senior day and punching our ticket to Tampa. I would be remiss if I did not take some time to thank the amazing senior leadership on the ’09 Tigers . When Clemson signed this class I knew how special and talented they were; I knew that they were going to have a huge impact at Clemson and it has been a pleasure to watch them turn Clemson football around. And today they get the ultimate reward for 4 years of hard work and sacrifice. Senior Day is always special, but this year these men get to win the Atlantic Division. I truly believe this will be one of the most exciting and emotional senior days in the history of Death Valley. So enjoy every second of it Clemson Girls and soak it all in. I get chills just thinking about it. Can you imagine how loud Death Valley is going to be when CJ takes his last run down the hill? 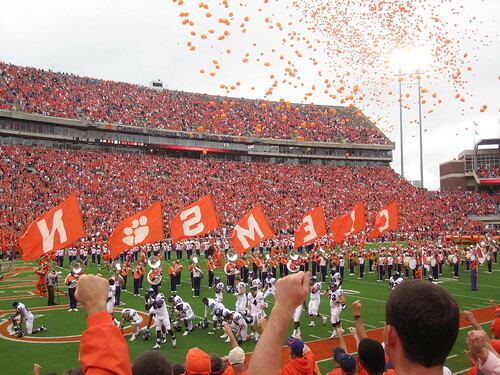 Can you imagine the fervor in the stands and on the field when Clemson clinches the Atlantic? I want to thank our football coaches, team, and especially our seniors for giving us this day. It would have been so easy to roll over after the Maryland game and be “the same old Clemson” but instead you turned the entire season around. Clemson is playing as good of football as anyone in the country right now-we are finally living up to our talent. Our seniors have been amazing their entire careers at Clemson, but especially this year. Their leadership has been amazing. Seniors like Kavell Conner who has been a beast of a linebacker, Rendrick Taylor, Cory Lambert, and Kevin Alexander. Michael Palmer is one of the best and most consistent tight ends in the country, and I am still trying to figure out how he was able to hold onto that ball in the midst of a concussion against Miami earlier this year. Thomas Austin has been the leader of our offensive line and been an integral part of their development and success over the course of this year. He is one of the best things an offensive lineman can be-incredibly physical and consistent. Crezdon Butler has been a beast of a cornerback while at Clemson and will leave Clemson as the school leader in interception return yards. Both he and senior Chris Chancellor are a huge reason that Clemson has one of the nastiest and stingiest secondarys in the nation. Chris Chancellor and Butler have combined for 21 interceptions in their career at Clemson. Chancellor pulled down two of those interceptions against Carolina last year. Ricky Sapp is the senior statesman of Clemson’s tremendous and dominating defensive line. He has been wreaking havoc on opposing quarterbacks all year long and he has been a pleasure to watch play all four years at Clemson. He came in out of high school as a 5 star and an All American and he has lived up to every expectation. He has also excelled in the class room even making the honor roll last semester. Jacoby Ford is the fasted player in college football, the fastest player in the history of Clemson football, and I cannot imagine anyone faster will ever play here again. Of course Ford has freak of nature speed, but he also has great hands and is a great blocker. He can do anything and has exhibited tremendous senior leadership this entire season. For about the first 5 games he was the only receiver we had, and still opposing defenses could not contain him. Now our receiving corp is playing great football and much of the kudos go to Ford. He is second in the history of Clemson in 50 + yard touchdowns and with Spiller has formed the most dominant all purpose tandem in the history of college football. Jacoby is also the reigning 60 m indoor track national champion and was on pace to win the outdoor 100 m until sustaining a leg injury in the middle of the race. He is going to blow the NFL scouts away at the combines this year. And finally CJ Spiller. How do you thank the greatest player in the history of Clemson football? He has been simply spectacular to watch these last four years. His statistics are amazing, his high light reel is unparalleled, and on top of all of his athletic talent he is a Christian, humble, hard working man who takes his position as a role model very seriously. He excels in all facets of the game, school, and life. Spiller will be in the Ring of Honor one day and I say sooner rather than later. Spiller deserves the Heisman trophy, and he is a viable candidate. The award is intended for the best player in college football; it is not a life time achievement trophy and it should not be only for the best player on the best team. Spiller is on every Heisman watch list and he has a legitimate chance of winning it now. Thank you CJ and all the seniors for everything you have brought to Clemson University! In the midst thanking our seniors though, we also have a huge game with the Virginia Cavaliers. Their offense is one of the worst in the conference and their defense which started the year strongly has given up at least 420 yards in the last 3 games; Clemson is at home, it is senior day, and this is for all the marbles—Clemson handles this game. Virginia is last in the ACC in total offense and points scored, and our defense is amazing. The Cavs have given up 428 points in the last 4 games and have only scored over 21 points twice this year. They are average giving up over 3 sacks per game and we lead the league in sacks. They do have some quality wins this season, particularly over North Carolina and they are a big physical team. The Cavs employ a 3-4 defensive alignment, which is not a defense Clemson usually sees. So it may take some getting used to, but our offense is too talented to be really hindered by it. Clemson wins big today and we all enjoy a special afternoon in Death Valley. I already have the champagne on ice and ready to pop in celebration of Clemson finally winning the ACC Atlantic! Go Tigers! Today’s game is also Military Appreciation Day and I would like to take a moment to thank all readers who have served or have relatives serving in the Military. God Bless our service men and service women!